With the explosion in the popularity of superheroes, everyone is getting in on the action, LEGO included. 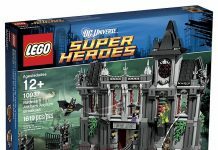 LEGO had done superhero sets in the past, but it wasn’t until the 2010s that the superhero theme took off. Aside from Marvel, DC is one of the big subthemes to their ongoing Superhero theme. Like the DC Animated Universe, the DC Comics LEGO sets started off with Batman, but have since expanded on that. They now do sets for A-List Superheroes like Superman, Wonder Woman, Aquaman, Flash, and Green Lantern. The theme has also gained popularity due to several TV specials and video games. Fun Fact: The DC Comics sub-theme was previously known as DC Universe. Another Fun Fact: Everything you see in the LEGO Batman movie is 100% digital, from the plates and gears, to the small handguns and hair pieces. Also, every brick features randomly added scratches to make the whole scene look more realistic.